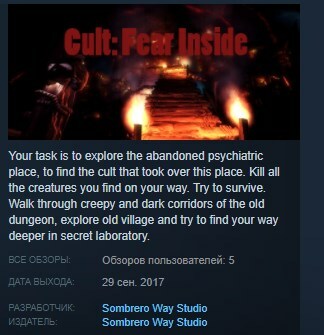 Your task is to explore the abandoned psychiatric place, to find the cult that took over this place. Kill all the creatures you find on your way. Try to survive. Walk through creepy and dark corridors of the old dungeon, explore old village and try to find your way deeper in secret laboratory, but be careful, because there are mysterious forces that are watching you and these forces are going to taste your blood. Go to the end and meet the most dangerous fear. -- Many, many dungerous enemies. Try to kill them all! -- Short, around an hour story. -- Enjoy realistic graphic - we tried to get out of the engine everything we could. -- If you buy this game, you help us with our next game, so we can have enough funding to work on the game of our dream. -- By buying this game, you are going to support our next project. -- Trading Cards will be added soon!